Thanks to the property’s reputation for opulent wines and its dramatic mountaintop position, its tasting room is one of the most popular in the region. In past years, I have occasionally had to fight my way through crowds of visitors on a Saturday morning on my way to a tasting appointment. This time I showed up on a quieter weekday for a comprehensive vertical tasting of the estate’s top bottling, the Reserve Cabernet Sauvignon. I tasted with Steve Pride, who took over management of the estate with his sister Suzanne following the death of their father Jim in 2004, and with Sally Johnson, who has been in charge of winemaking here since 2007. Although the 19 vintages I tasted showed remarkable consistency, I was especially intrigued by some of the older wines that had become a bit more claret-like as they absorbed some of their massive baby fat. Clearly, consumers who have purchased recent vintages of this bottling should not be in a hurry to pull corks. The Reserve Cabernet has always come primarily from 11 acres of vineyards planted next to the winery in 1980 on AXR rootstock, using a variant of Clone 7 that was developed by Joe Heitz in his Bella Oaks vineyard. The vineyard, the highest on the property, is planted on a 10% south-facing slope at an altitude of 2,100 feet. The rest of the fruit that goes into the Reserve Cabernet comes from a 4-acre block planted in 1994 to Clone 337. Bob Foley first bottled a Reserve Claret in 1993, then introduced the Reserve Cabernet the following year. It’s another world high up in the Mayacamas Range, as the flowering and harvest take place much later at this altitude than they do on the valley floor. Daytime temperatures in summer are cooler than down below but nights are milder. And while valley-floor vineyards often sit in cool, damp morning fog, the sun is usually shining at 2,000 feet. According to Steve Pride, afternoon temperatures on the top of the mountain rarely exceed the upper 80s at the peak of summer while some nights cool off only to the low 70s. On these well-drained soils, the growing season is steady and long. From the start, Foley was known for harvesting very late, often well into November. “I was looking for flavor maturity that tracked the darkening and hardening of the seeds,” he told me recently. “The Pride vineyard slopes west so it picks up more afternoon sun than the vineyards in the Spring Mountain appellation that tilt east. At the same time, the stand of trees to the east protects the vineyard from offshore winds that dehydrate grapes. So we were able to let the fruit hang without worrying about insufficient acidity.” But even within the core 11 acres there’s enough variation in soil content, vine vigor and cluster size that the vineyard was often harvested over a period of a month, as Foley identified distinct ripening zones and picked each one separately. Foley began with very ripe fruit but did not do a particularly extractive vinification. Fermentation was carried out with commercial yeasts, and the wines spent no more than ten days on their skins before being pressed. Foley used a good percentage of new oak in the early vintages but by the turn of the century was down to about 33%. 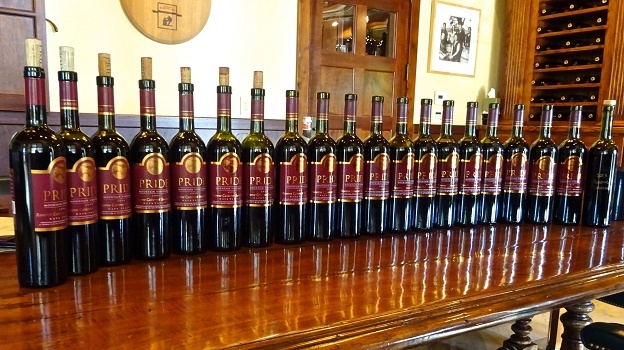 (Steve Pride noted that the 2001 through 2003 vintages actually got “double oaking”: the barrels selected for the Reserve bottling were blended and then racked into a fresh set of new barrels.) Foley originally favored the cooper Nadalié but over the years began adding barrels from Taransaud, Darnajou and Ermitage for this bottling. The early vintages were made off-site, but following the construction of a modern winery and an extensive system of caves, winemaking moved back home in 1997. Foley was responsible for winemaking through the 2004 vinification; since that time he has focused his attention on his own Robert Foley Vineyards wines. 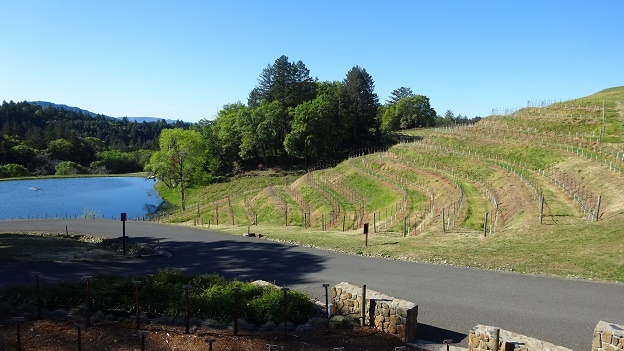 Two thousand five and six were transition years here, with Foley’s long-time assistant Romel Rivera teaming up with Sally Johnson, who then took over lead winemaker duties with the 2007 harvest. In the early years, the Reserve Cabernet was racked a total of five times and was bottled two years and two months after the harvest. Today, bottling is several months earlier: during the second half of August. The pHs are typically in the 3.75 to 3.8 range without acidification, as the high-altitude fruit retains healthy acidity and the wines are rich in extract and phenolic compounds. Through the 2002 vintage, the labels showed Napa Valley as the appellation, but some of the fruit was actually from across the county line. So the wines have been bottled as Sonoma County/Napa County beginning with the 2003. 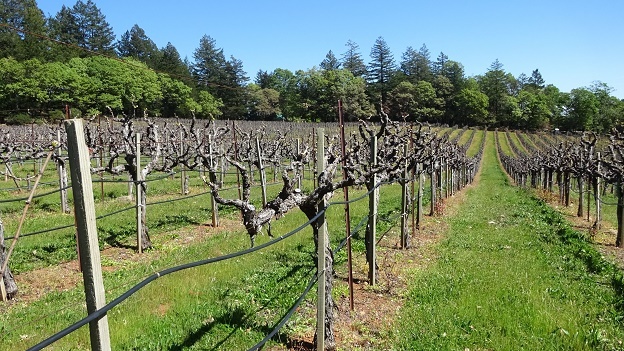 Since that time, the percentage of Sonoma-side fruit has steadily increased, as some additional blocks of vines from the Sonoma side have worked their way into the blend. While the Reserve began as a 100% Cabernet wine, small touches of Petit Verdot have been added in most vintages since 1997 “as a natural acidification and to add violet and spice lift,” according to Steve Pride. The style here has changed slightly since Johnson took over. First off, the estate purchased a gentler destemmer that has allowed them to eliminate jacks (i.e., pieces of stems) from the fermenting must, thus making for suppler tannins. “And with 2009 and 2010 we toned down the ripeness,” Johnson told me. “The alcohol levels are somewhat lower now,” she said, adding that they were probably even higher in the earlier vintages than the labels indicate. Johnson admitted learning something valuable from the cooler 2010 and 2011 vintages, namely that “wines can be full-flavored and complex without pushing the grapes to such an extreme level of ripeness.” She has continued to seek that balance since then although she admitted that this was harder to do in the much warmer 2013 and 2014 growing seasons.